Mr. Dembling was Editor-in-Chief of the Rutgers Law Review. He then served a Clerkship with the Honorable Arthur W. Lewis, a presiding judge of the Appellate Division of Superior Court of New Jersey. Mr. Dembling was appointed assistant United States attorney for the District of New Jersey, and served as Chief of the Frauds Unit. Mr. Dembling received the Special Achievement award from the attorney general of the United States for his service on behalf of the Justice Department. 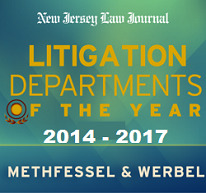 Mr. Dembling is one of the founders and past chair of the Insurance Law Section of the New Jersey State Bar Association. He has been lecturing on insurance coverage law and litigation in regular seminars for the New Jersey Institute of Continuing Legal Education and the New Jersey State Bar Association, and the American Bar Association and other organizations for more than 20 years. He has over 25 years of experience in litigating insurance coverage and environmental law issues as well as professional malpractice claims. He has argued many insurance coverage cases before the Supreme Court of New Jersey, including the landmark case of Brill v. Guardian Life Insurance Company, wherein the Supreme Court established the standards for the granting of Summary Judgment in New Jersey Courts.